We are all shaped by our memories. Each of us has been through something that has shaped us and made us who we are. Sights, sounds, smells, and tastes can all trigger memories and remind us of happy (or unhappy) times. For me, when I smell bread baking, I am 12 years old and I am returning home from school and smelling the bread that my Italian grandmother made each day. The smell of soup cooking triggers a more recent memory of meeting my daughter for the first time in a Russian orphanage. When I hear “More Than a Feeling” by Boston on our local classic rock station, I am sitting in the back of my parents’ station wagon with my brothers driving to Pittsburgh on our summer vacation. 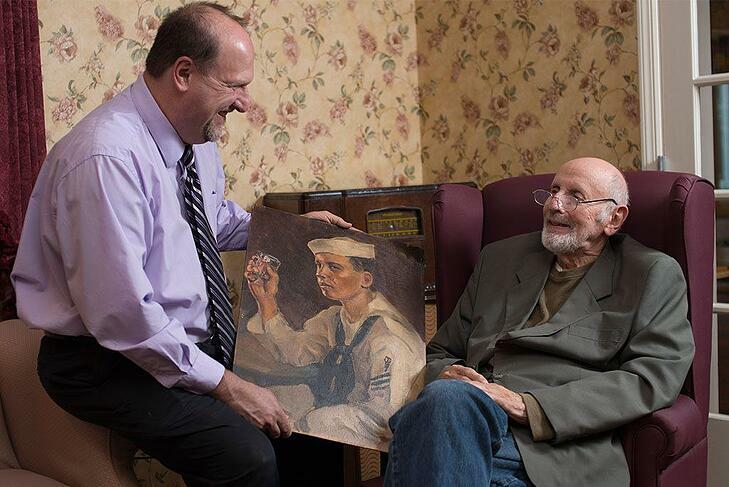 Reminiscing can be a comforting and enjoyable exercise for people of all ages. For residents afflicted with Alzheimer’s disease or other dementias, reminiscence therapy can be a valuable, therapeutic tool for them as well as for their caregivers. When I moved to Pennsylvania and became the Administrator at The Easton Home in 2003, I saw an opportunity to improve the overall environment in Chapelwood, our memory support neighborhood. I had recently attended an Alzheimer’s care seminar and one statement stuck with me: “We don’t force people with dementia to conform to our reality, we conform to theirs.” While on vacation at Walt Disney World, we were dining at the 50’s Prime Time Café, a themed restaurant designed to make you feel that you were in a 1950s sitcom. 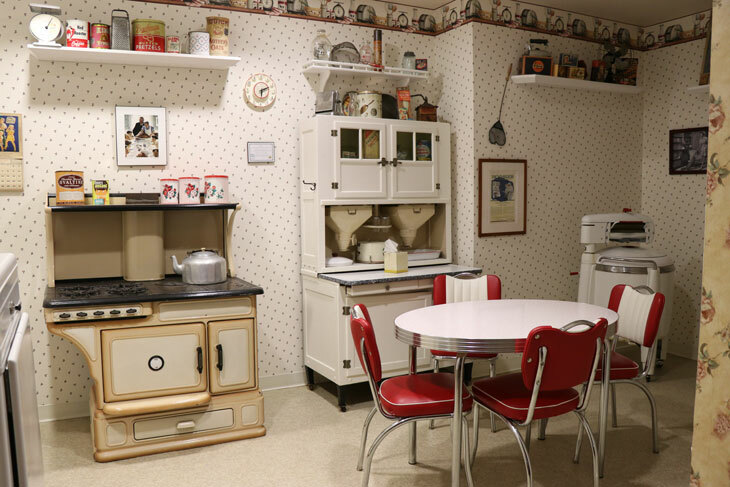 The dining room was designed to make you feel that you were eating in your mother’s kitchen, complete with your “mother,” who was actually a waitress in character reminding you to eat all of your vegetables and keep your elbows off of the table. From that experience, I came up with a concept of designing several rooms to look like areas that our residents may have grown up or raised a family in. We purchased vintage furniture items such as refrigerators, wringer washers, and Hoosier hutches. We decorated with vintage tins, detergent boxes, stock photos, and other items purchased from antique shops and on eBay. We purchased a 1940’s radio and replaced its parts with an iPod system that plays Bing Crosby, the Andrews Sisters and Glenn Miller on an ongoing loop. In essence, we created a home that our residents would be comfortable in. We didn’t stop there. We began to work with a talented group of artists at Freehand Murals, who designed mural scenes of Pennsylvania farmland, a General Store, and a Bakery (with movie prop pies and cakes). They even created a window which changes scenes with the seasons. Summertime ice cream trucks and picnics give way to Halloween costumes and raking leaves once the weather starts getting cooler. In our hallways, we created reminiscence stations with familiar items related to different categories such as sports, travel, dogs, weddings, and World War II. Stock photographs were purchased showing scenes that everyone could relate to: a little boy blowing out birthday candles. a mother feeding her baby, and kids chasing the school bus. Everywhere you look, there is something sure to stir a memory. There are even posted open-ended questions designed for use by staff and families to start conversations based on the station they are standing at. Why is reminiscence therapy so important? Alzheimer’s Disease and other dementias rob victims of their memory. Most dementias affect the part of the brain that controls the short-term memory. A person may not remember what they just had for lunch, but can remember details about their wedding day. By engaging a person with dementia in reminiscence therapy, it can improve their ability to communicate, alleviate signs of depression and agitation, provide relief from boredom, and improve their feeling of self-worth and importance. It can also be a valuable tool for family members to use when visiting. Their loved one may no longer remember who they are, but together they can have a meaningful conversation about their past experiences at one of the reminiscence stations located throughout the Chapelwood neighborhood. While standing at the fishing station, a question such as, “Dad, what was the biggest fish that you ever caught?” could blossom into a conversation between a son and father about childhood fishing trips together. 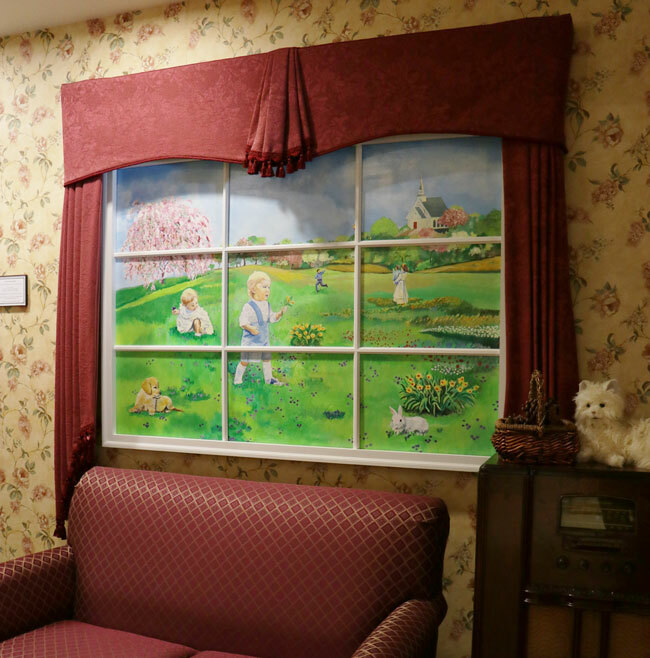 At The Easton Home, we focus on the different senses to reminisce with residents as part of our daily program. Activities such as baking cookies and bread stir memories through conversation, the feel of the dough as it is being rolled, and the aroma of their finished products baking. We also use aromatherapy essential oils and diffusers as a non-pharmacological approach to overall wellness. Visual cues such as photo books and scrapbooks are also used in our daily programming. Vintage LIFE magazine articles and advertisements are placed in scrapbooks throughout our neighborhood. Photo books created by families of old family photos and life events are another valuable tool for reminiscence. It’s Never Too Late® is another major feature of our programming. 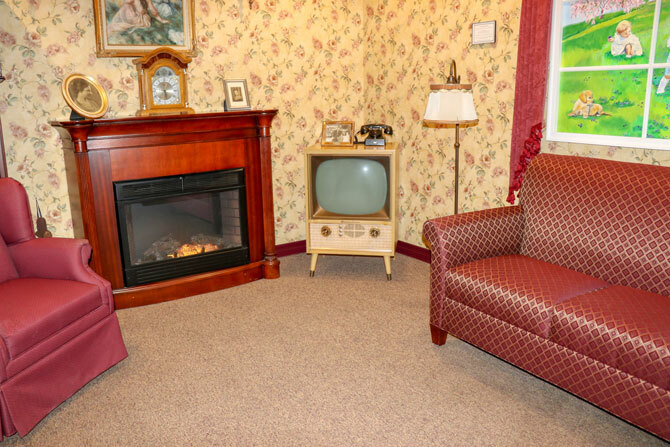 This computer system allows us to use trivia, vintage commercials, newsreel clips, webcams, and games to stimulate reminiscence and allow our staff, residents, and families to interact. 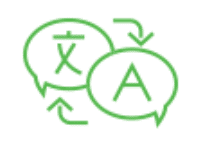 One of the things that we are most excited about is our certification in the Music and Memory ProgramSM. Featured in the award-winning documentary Alive Inside, this program created by Dan Cohen focuses on creating individualized playlists on iPod featuring a resident’s favorite songs. Playing music that has personal significance to residents can stimulate parts of the brain and can be powerful cues for them to engage and to be themselves. Our memory support neighborhood was just featured nationally in newspapers across the country and in the February 2016 issue of Oprah Magazine. Our program is led by Jennifer Woolley, who is the 2015 recipient of the PRIDE award given by the Delaware Valley Chapter of the Alzheimer’s Association for professional recognition in dementia excellence. "As soon as they [residents] walk in, they become comfortable…and it takes them back to a place that they're familiar with," Jennifer says. Her philosophy is to “take away the dementia part and focus on the person, living life, and having fun.” We are still hoping to transform several other areas in our neighborhood including redesigning the main kitchen and dining area as well as our spas and bathrooms. Comedian Seth Rogen recently addressed Congress about how Alzheimer’s has affected his family and how we need to work to find a cure. He joins other celebrities such as Maria Shriver, Terrell Owens, Wayne Brady, Bradley Cooper, Julianne Moore and Natalie Morales, as well as thousands of others nationwide who have personally been affected by this disease, and who advocate on behalf of those who are not able to advocate for themselves. You can learn more about Mr. Rogen’s cause here. Alzheimer's disease currently affects millions of people around the world today. There are an estimated 5 million men and women in America alone living with the disease. That number is expected to rise to 16 million in the next 35 years. Until a cure is found, the staff at the Easton Home will make sure that we are sharing our past memories and making new memories together. Paul Cercone has been the Campus Administrator at the Easton Home since 2003 and has over 24 years of experience in long term care. Paul graduated from Florida Atlantic University with a Bachelor’s degree in Health Services Administration and from Lynn University with a Master’s degree in Eldercare Administration. 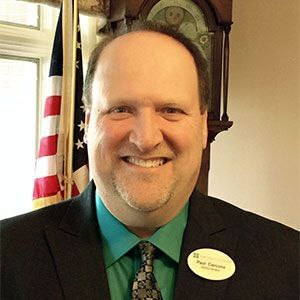 He was inducted into Presbyterian Senior Living’s President’s Club in 2012, and has presented at the Pennsylvania Culture Change Coalition’s Accord.